New York (AP) – Scientists say they’ve discovered evidence of a frenzied mating ritual by dinosaurs: long grooves in the ground etched by the pawing of clawed feet. Such behavior is seen nowadays in some birds, and the discovery suggests that two-legged, meat-eating dinosaurs called theropods did it about 100 million years ago, the researchers said. Martin Lockley of the University of Colorado Denver said the dinosaurs, probably males, apparently gathered in groups and “went crazy scraping” with their clawed, three-toed feet to attract mates. The beasts were built roughly like smaller versions of a T. rex. Footprints near the grooves suggest a variety of body lengths, up to about 16 feet (4 meters) from snout to tip of the tail. The grooves they carved are up to 6 feet long. Lockley, an emeritus professor of geology, is an author of a paper on the discovery released Thursday, Jan. 7 by the journal Scientific Reports. The grooves were found at four sites in Colorado. 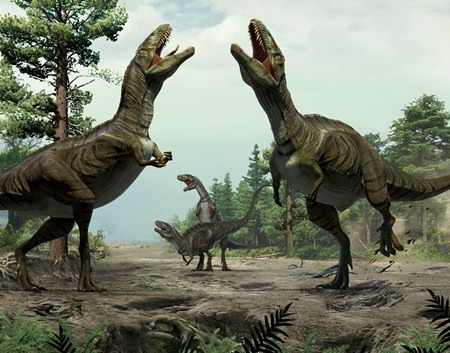 Dinosaur expert Thomas Holtz Jr. of the University of Maryland, who didn’t participate in the work, said it’s reasonable to think that theropods created the grooves. But was it for mating? Holtz said he wasn’t convinced that the new paper had sufficiently ruled out other explanations. But he added that there’s no particular evidence for rejecting the mating idea. “Whatever behavior is being recorded here, it is an expression of the fact that dinosaurs – like all animals – did more than hunt and attack and devour and fight and all that limited set of behaviors that popular culture often portrays,” Holtz wrote in an email.